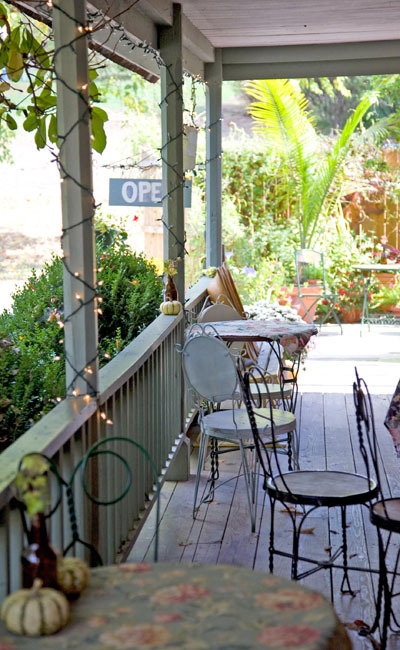 Enjoy delicious lunches and evening fare in an historic old 1800s brick farmhouse. Situated on the grounds of The Flower and Herb barn, a Brown County, Indiana flower and plant nursery, the Farmhouse Cafe and Tea Room offers a one-of-a-kind dining experience with seating inside the restored farmhouse, on the front porch or on the beautifully landscaped patio. Dine on unique salads made from garden fresh, seasonal ingredients, sandwiches featuring special herbal spreads, and dinner items ranging from wood grilled sirloin steak to vegetarian pasta dishes. Daily specials, freshly made soups and herbal teas offer plenty of variety, and you can complete your meal with a delicious dessert or fruit smoothie. 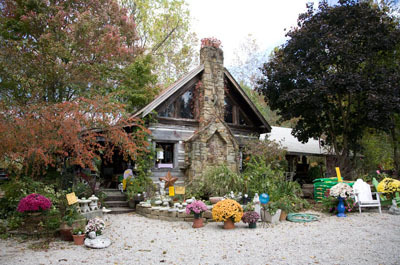 Located only 3 miles from Bean Blossom, Indiana, the Farmhouse Cafe and Tea Room is just a short, scenic drive from Nashville, Indiana, nestled in the hills of Brown County. Groups of 4 or more please call ahead. Check us out on Facebook for daily specials, seasonal hours and more!